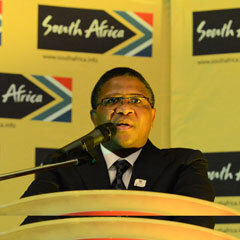 Johannesburg - South Africa's Olympic team has restored the nation's pride, Sports Minister Fikile Mbalula said on Tuesday at its arrival home from the London games. "There are no words that can describe the joy you have delivered. I don't think you can completely understand what you have done to this great nation," he told the athletes who brought home six medals. "Today we are united, black and white, because of your deeds... what you have done will remain in the annals of history." The first gold medal, won by swimmer Cameron van der Burgh, had changed South Africa, Mbalula said. "When that gold was delivered it [all] changed for our nation. I want to say to you Cameron, 'job well done'. We would have been disappointed had you not delivered that gold." He said that you could hear a pin drop when swimmer Chad le Clos beat the United States' Michael "Flaps" Phelps. "Chad Le Clos is a surprising young man. He is a young man with a big heart," he said. "When Chad beat Michael Phelps, the atmosphere went quiet... Those Americans know that Chad beat Phelps." He said South Africa's heart "nearly stopped" when it looked as though runner Caster Semenya would not pull through to win silver. "Caster represents the greatest guts for women. It doesn't matter where you come from, you represent a symbol of courageous women in South Africa." Mbalula said the country was proud of rowers Sizwe Ndlovu, Matthew Brittain, John Smith and James Thompson, who won gold in the men's lightweight four. "Then came our rowing team. And they did us proud. The belief in our athletes and their dedication brought us gold," he said. "With [canoeist] Bridgitte Hartley, you brought us bronze and are counted among the winners of our nation. On Women's Day it was Bridgitte's name that was reverberating in London." Mbalula and ANC stalwart Winnie Madikizela-Mandela received the first of South Africa's Olympic athletes when they arrived at the OR Tambo International Airport, in Kempton Park, on Tuesday morning. Semenya and Hartley stood in front of Madikizela-Mandela as supporters used their cellphones to take photographs. The crowd of supporters gathered at the airport sang the national anthem for the athletes, who stood in a line with their hands on their chests. A loud cheer, whistles, and vuvuzela blasts followed. Mbalula said Madikizela-Mandela came to the airport although there was no formal invitation for her. "She was not invited to the airport, but she didn't have to be called to come here and support the team." SA Sports Confederation and Olympic Committee chief executive Tubby Reddy said the team's performance was the best since the end of apartheid. "The young people standing with you, those medals round their shoulders, they deserve a big round of applause," he said. The team won six medals, half of the goal the SA Sports Confederation and Olympic Committee had set. Reddy joked: "There is no 16 for 2016", the date of the next Olympic Games. Chef de mission Patience Shikwambana said Van der Burgh's gold had fired up the rest of the team, and she congratulated him. "Ten of our athletes made the finals and we are proud. We hope they've inspired the youth. You are world champions, and it's because of the support of your country and family, and you need to stay humble. We salute you and well done." Earlier Le Clos whipped the crowd into a frenzy when he introduced his fellow medallists. Le Clos and Van der Burgh had girls screaming their names, amid the ululating and toyi-toying masses. Before the athletes made their appearance, thousands of people waving flags pressed against the security cordons, and people watched from the upper deck of the arrivals hall. Semenya won silver in the women's 800m, and Hartley bronze in the women's kayak single K-1500m sprint. Le Clos won gold in the men's 200m butterfly and Van der Burgh in the men's 100m breaststroke, setting a new world record. Le Clos also won silver when he tied for second in the 100m butterfly.